Yesterday I was sitting on a bench in the China Pavilion of Epcot, enjoying the sunshine and the feel of the wind on my face. About five feet in front of me a bumble bee landed on the concrete. 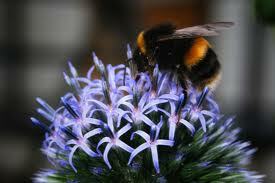 It was one of those big fuzzy bumble bees that move slowly and seem too busy with gathering pollen to bother with you. The bee stayed on the concrete, moving very little. Five minutes later it was still there but now the only movement from the bee was the breeze catching under it's wings, lifting them to flutter a bit but not lifting the bee for flight. Then I realized the bumble bee was no longer moving at all. It had died. I realized I was saddened over this small creature's death. I started thinking about how honeybees are dying at an alarming rate all around the world and no one knows why. I wondered what caused this bee to die. I hoped no one would unknowingly step on this tiny creature while I was there. What does any of this have to do with keeping the pounds off? Think nothing? Think again. . .
Keeping the pounds off is a healthy goal but if I make it my life's vocation it is as unhealthy as eating my way up to 385 pounds. There are big moments and small moments and even tiny little bee moments and they all make up our lives. Narrowly focusing most of my day solely on weight loss, diet, exercise and food issues means precious moments of my life would be missed simply because I did not take the time to 'see' or experience them. I will never see the sunrise if I insist on always facing west. I have already missed a great deal of special moments in life by my self imposed prison of thinking I could not take my super obese body out in public. I missed out on many experiences available to me because I was afraid or too shy or felt too fat. Things I should have noticed - happening in front of my eyes - I missed because life was all about 'me' and 'me' was too worried about the future to experience today. "Me' was too busy with some current obsession to give full attention of the world around me. Keepingthepoundsoff.com is not just about keeping weight off my body. It is also about keeping pounds of fear, unhealthy obsession, resentment, and selfishness out of my life so I can appreciate my WHOLE life, not just the parts that involve getting a pat on the back or announcing a new waist size. Life is a whole food. If I process it too much I will lose the vitamins, nutrients and taste that make it wonderful. To quote one of my favorite characters "Life is a banquet and most folks are starving to death." How are you keeping the pounds (that cannot be measured by the scale) off? I don't know if it's the hormones, the extra potassium in my body, or the actual emotive quality of this post, but it just made me cry. Very beautifully said. Maybe it is all three? In any case, thank you for your honest feelings! Jane, you are so right, and this was very well-written. Thanks for the reminder.